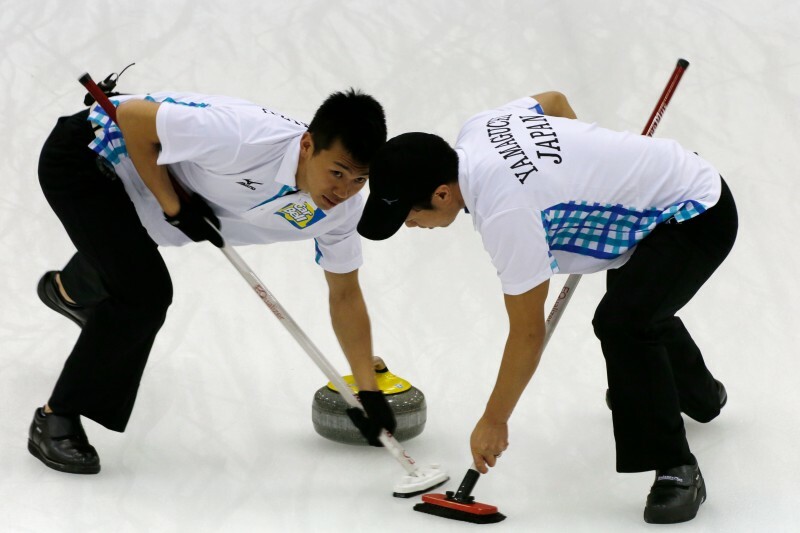 China, Japan and Korea men and women were the first teams to qualify for the semi-final stages following the eighth session of play at the Pacific-Asia Curling Championships 2014 being held in the Karuizawa Ice Park Curling Hall in Karuizawa, Japan. In the men’s competition, Japan made it five wins from five games thanks to their win against New Zealand. Japan took the lead in the first end thanks to an open hit for one point before they stole two points from the next two ends thanks to some mistakes from New Zealand. In the second end, New Zealand fourth Scott Becker clipped a guard with his last stone then, in the third end, failed with an attempted double takeout. Becker did get his team onto the scoreboard in the fourth end however but could have had more than the one point they scored had his attempted split worked out better. Japan edged ahead further in the fifth end when skip Yusuke Morozumi drew into the house for two points. After the fifth end break, New Zealand blanked the next two ends before fourth player Scott Becker made a hit and stay for one point. Japan’s Yusuke Morozumi then made a takeout for two points in the ninth end after which New Zealand conceded the game. In the other men’s games, China skip Jialiang Zang was left with a simple task of drawing into the house for four points in the first end of their game against Kazakhstan. China then went on to win by 11-2 after nine ends of play to record their second win of the day and qualify for the semi-finals. Korea were the third men’s team to guarantee their semi-final spot, but found it tough going against Chinese Taipei. This game went right down to the last stone, with the teams tied 5-5 after nine ends of play. Chinese Taipei couldn’t take advantage with last stone in the final end as skip Randie Shen’s final draw was over swept to hand Korea one point for a 6-5 win. In the women’s games, Korea maintained their unbeaten record to qualify for the semi-finals as they defeated Australia 6-4. The key moment in this game came in the third end when Korea skip Eun Jung Kim made a draw for three points before Korea eventually ran Australia out of stones in the tenth end. In the other women’s game, hosts Japan defeated China 7-4. China did not get on the score sheet until the seventh end, by which point Japan had scored four points, including single point steals in the fourth, fifth and sixth ends. Japan skip Ayumi Ogasawara then made a draw for three points in the eighth end to take a crucial advantage as her team went on to win 7-4 after nine ends of play. The ninth session of play will see New Zealand v Japan, China v Australia in the women’s competition and New Zealand v Kazakhstan, Korea v China (WCTV webstream), Australia v Japan in the men’s competition, all at 09:00 local time (JST).